With the temperatures in the steamy range (typical for a St. Louis summer), I'm taking advantage of quick meals that use limited heat...especially by way of the oven. This means a lot of sandwiches and stuff made on the grill. The ingredients of these sandwiches require a little bit of stovetop time, but hardly enough to heat up your kitchen! I added some leftover quinoa to the original filling, which worked nicely to bulk it up and add some extra protein. 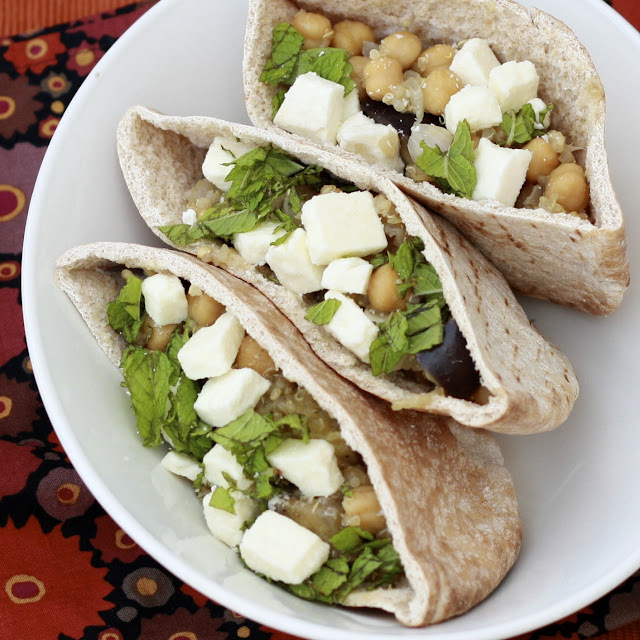 Don't omit the fresh mint or the salty feta, which give a bunch of flavor to a sometimes bland vegetable (eggplant). Knowing we have a few more months of super high temperatures, I wouldn't be surprised if more of these pita sandwiches make their way onto our table! Tell me, what are your favorite no-cook (or minimal-cook) summer meals? Happiest of birthdays to my grandma, one of my number one blog supporters! She's a huge blessing in my life and I'm so thankful to be with her, celebrating today! 1. Heat oil in a large nonstick skillet over medium-high heat. Add eggplant cubes and onions. Saute until soft and beginning to brown (about 9 minutes). Stir in garbanzo beans, cumin, quinoa, and lemon juice. 2. Saute until heated through and flavors blend. Add 1 tbsp of garbanzo bean liquid at a time to moisten if mixture is dry. Stir in 3 tbsp mint and 3 tbsp feta cheese. Season generously with salt and pepper. 3. 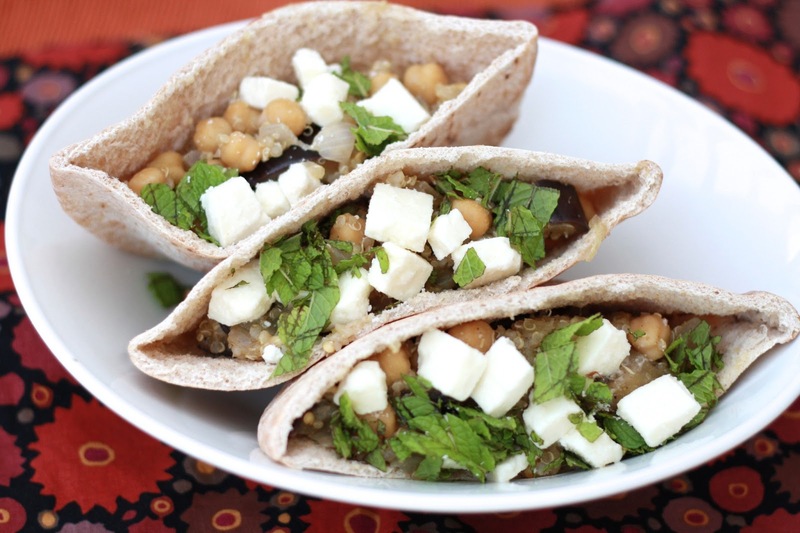 Spoon eggplant mixture into pita breads. 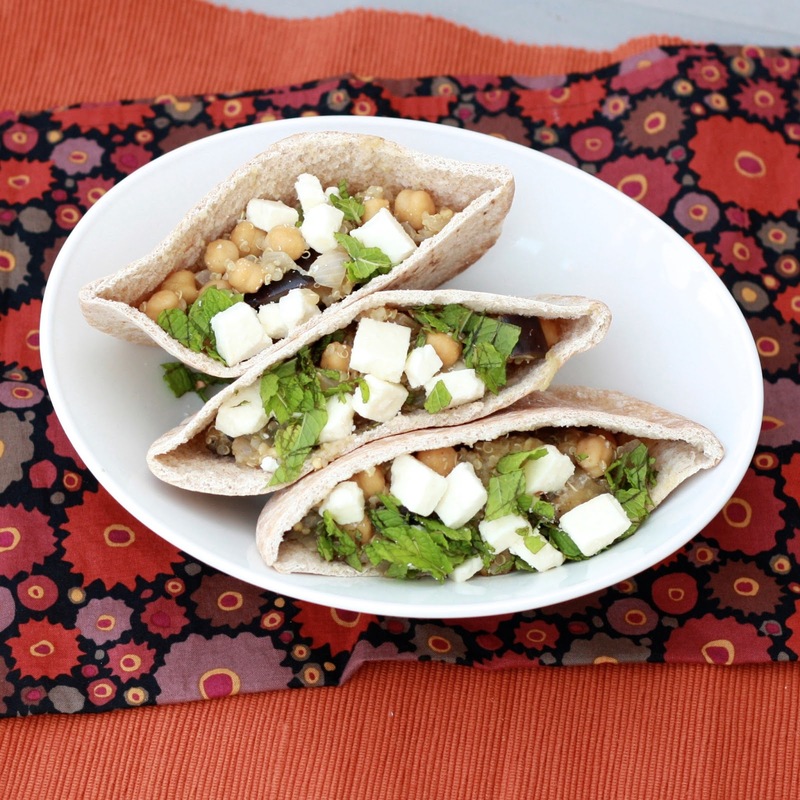 Sprinkle with remaining mint and feta. Serve immediately.